It’s been a good week taking a look at several aspects and features of the new Apple Watch Series 3. 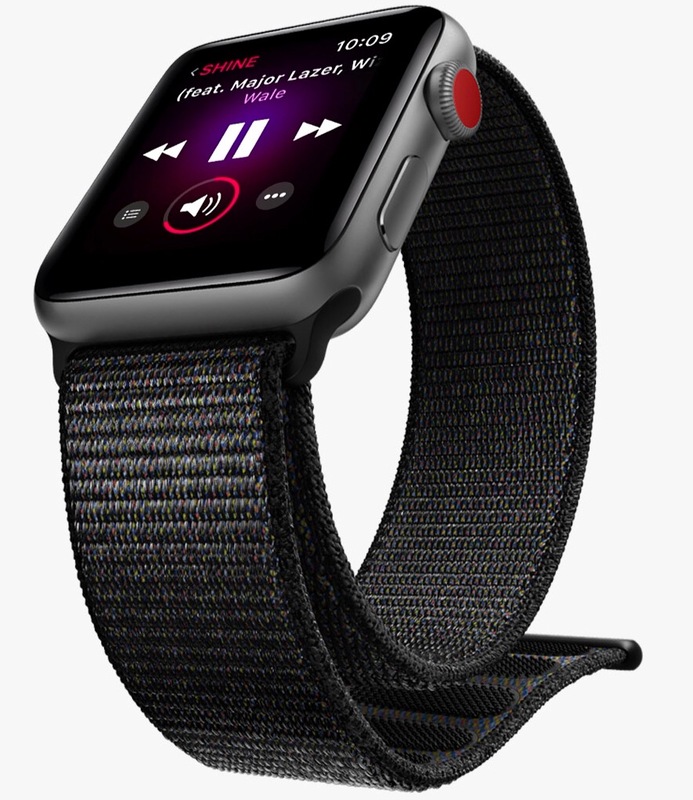 I was already a fan of the Apple Watch platform and watchOS 4, so liking this new device isn’t a major surprise. However, I enjoy and appreciate the independence aspect of the new Watch more than I initially expected. Now, as I come close to closing out this series, I’m circling back to a couple of the primary features of the device. Tonight, the focus in on Siri. Thanks to the beefier processor and new speaker of the Series 3, Siri has finally found her voice on the Apple Watch. Siri has been present from the beginning, but now we have the option of voice feedback. Siri does and says most of the same things you might be used to from the iPhone or iPad, right down to the silly and snarky responses. There are still some functions that are limited to the phone, chief among which is the ability to add or work with Notes. 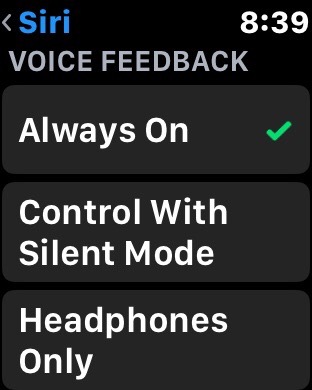 The settings for Siri’s voice feedback are available from the Settings app on the Watch. Just go to Settings-General-Siri to choose how you want Voice Feedback to be handled. I appreciate that Apple gave users a comprehensive set of options here. I know that, like myself, many Apple Watch users keep the sound muted most of the time and rely on the Taptic Feedback for notifications. Now you can pair Siri’s Voice Feedback up with Silent Mode, or you can have it operate independently. Or, if you prefer, you can limit Siri’s voice to use with your AirPods or other Bluetooth headphones. Siri’s Voice Feedback comes in loud and clear thanks to the Watch’s new speaker. This is one of the reasons that the controls are necessary, as you may not want Siri exclaiming loud and clear in public. However, there are other times, such as while driving, when having voice feedback from the Watch can be a big improvement over text only. The bottom line is, whenever you do want Siri to talk to you, the experience is actually quite good. 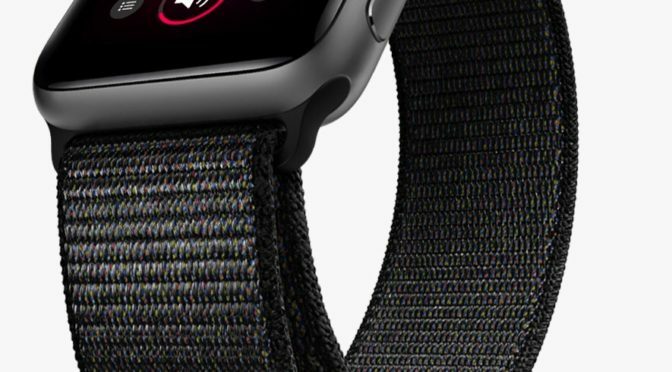 One of the strengths of Siri on the Watch is thanks to the fact that the device has a microphone that is specifically designed for voice input. The Watch’s dependence on voice input for user feedback made a sensitive mic a necessity from the outset. Because of this, Siri tends to recognize queries and transcribe dictation with greater accuracy than the typical experience on the iPhone. When I say that Siri works well on the Watch, I’m speaking more to the service’s strengths. Siri does things like add Calendar entries and Reminders and place calls very well. Siri is also good at certain types of searches, such as for directions, weather, upcoming appointments, restaurants and looking up sports scores and movie times. However, anyone who has compared Siri to other voice assistants certainly knows that it definitely has its shortcomings. The implementation on the Watch doesn’t fix these issues. It just enhances the areas where Siri already works well. Another of the new tent pole features of watchOS 4 is the Siri Watchface. This new face uses machine learning and your information and preferences in the Apple ecosystem to serve up important information throughout the day. The watchface uses a vertical card motif to present information that you can scroll through with the Digital Crown. The Siri Watchface can be set up via the Apple Watch app on your iPhone. As you can see here, there are several options that allow users to customize what types of data that they see. I like that there are plenty of choices for data types, but I appreciate even more the ability to turn off the ones that I don’t want cluttering up the feed. What makes the Siri Watchface interesting is that the information presented isn’t limited to just events and alarms. Your current music shows up on a card to give you a quick link to the Now Playing app for control. The face also selects key Photos and albums to add in for variety and reminders of memories. Current News can also be served up in your “feed,” if Apple News is enabled as a data source. Obviously none of this is new, as Google Now was doing similar things a few years ago. However, what makes this effort notable is how it contrasts with Apple’s well known stance on privacy. It shows that Apple is simultaneously embracing the need for pro-active notifications and serving critical data to users. 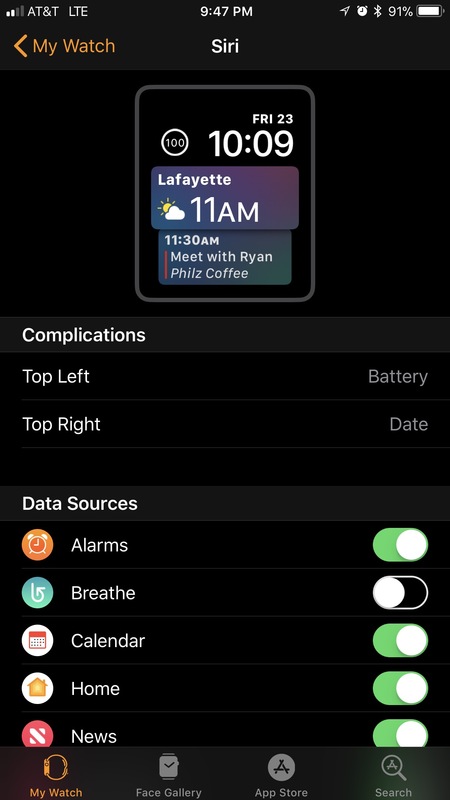 I would classify the Siri Watchface as a really good start on a feature that should improve by leaps and bounds if Apple keeps investing in it. That said, it’s definitely not perfect. It is currently bound by the imperfections of Siri and Apple’s services, but it still has utility even in this early form. The biggest downfall, in my opinion, is the restriction to 1st party services only. Hopefully, like with Siri on the iPhone and iPad, Apple will likely open the Watch’s version of Siri up to third party developers for specific on-device actions. Another issue that I have heard others mention as a complaint is the aesthetics of the Siri Watchface, or almost complete lack thereof. I can understand this, as the cards and background are very plain at present. I would expect this to change over time, with Apple adding capabilities like the ability to customize the look and opacity of the cards, and definitely the background. However, until then, sacrificing looks is the price of functionality. 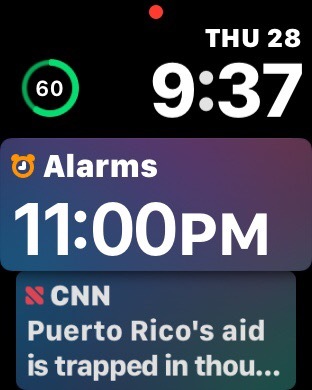 As easy as it is to switch between watchfaces, I see this is a very minor drawback, but it may limit some people from using the Siri Watchface as their go-to for day-to-day use. I’ve said it before and I’ll say it again here- the best Siri experiences in the Apple ecosystem are found with the Apple Watch and the AirPods. We already know that Apple is FINALLY starting to invest the kind of time, money, and effort necessary to push their AI, machine learning, and voice assistant ambitions forward. One of the places you see the beginnings of this is here with the Apple Watch. Apple won’t catch up overnight, but the improvements to Siri on the Apple Watch Series 3 show an increased level of commitment to their digital assistant, which can help them make up ground. Until that happens, the new Watch maximizes the strengths that Siri does have today. If you have any questions or observations about Siri on the Apple Watch, let me know here in the Comments section below, on Flipboard, on our Facebook page, or on Twitter @iPadInsightBlog.